Lorraine and David Crawford bought their piece of property in Copperopolis with dreams of vineyards, orchards and vegetable gardens. 7 1/2 years later, vineyards complete, wine racked for multiple seasons and vegetables canned, the Crawfords have less and less time for what they thought was their dream as their original dream has morphed into almost a full time job of helping people. In 2007, the Crawford's were able to retire from their high stress jobs at Lawrence Livermore Lab - David a computer scientist and Lorraine a weapons program secretary, both working daily with DOE, DOD, Homeland Security, NSA and more Government agencies with more acronyms - to settle down in Copperopolis and make beautiful wine together. Within a year Copper became "home" and they had begun to attend Copper Canyon Baptist Church where they met Don Hopper who told them about the efforts of the local food pantry to meet the needs of Copperopolis residents in need. One meeting with the food pantry folks and the Crawford's knew their calling to the foothills had taken a circuitous route through wine making and canning to helping those in need. Becoming active in the food pantry fulfilled a part in the Crawford's lives that their previously busy lives had yet to allow them to fulfill. Within a year of volunteering with the food pantry David was asked if he would chair the food pantry committee when Richard DeBussman stepped down, his response was, "Yes, if Lorraine is vice-chair." So became the dynamic duo. Soon thereafter the food pantry became part of a program called Feeding America through the Resource Connection whereby the local food pantrys' can obtain fresh produce for 3c per pound. Allowing the Copperopolis Food Pantry to bring quality produce to the community. Their efforts to bring food to those in need did not stop there as they penned a grant in 2011 and again in 2012 to the Calaveras Community Foundation who has generously granted the food pantry funds for both years. The Crawfords say this money is budgeted throughout the year to buy high protein foods, as foods high in protein "cost so much" which cause those in a lower income bracket to not be able to afford them. Approximately 53 families are utilizing the food pantry in Copperopolis with the numbers expected to rise. "This is a high number for February." Said Lorraine explaining how the numbers of families served fluctuates throughout the year with the lowest numbers in the winter months. The food pantry is veiwing this as a sign of things to come and is prepared to meet the needs of all thsoe in the community in need. If you have ever wondered how the enough food for 53 families arrives at the pantry, well thats also on the Crawfords 'to do' list. They contact local markets for the best deals, sometimes head to Costco, pick up food from San Andreas and locally all to be ready on the third Thursday of the month for distribution. Recently due to budget constraints the pantry had to move their location to the Lake Tulloch Bible Church with food storage now generously provided by Payless IGA. "We had one week to move and were in a bind. Kevin (owner of IGA) said to call whenever we needed anything...so we called. He was on vacation out of the states and told us we will get something done." Storage of food pantry food is now located at IGA. David said from here on out meat purchases will be from IGA. "They helped us without asking for anything in return, the least we can do is support them." David and Lorraine both shrug off their efforts as something they are called to and heap all the thanks and kudos to the volunteers that work within the pantry and the community as a whole. "We are able to help so many because of our volunteers and our community. This community is so amazing." 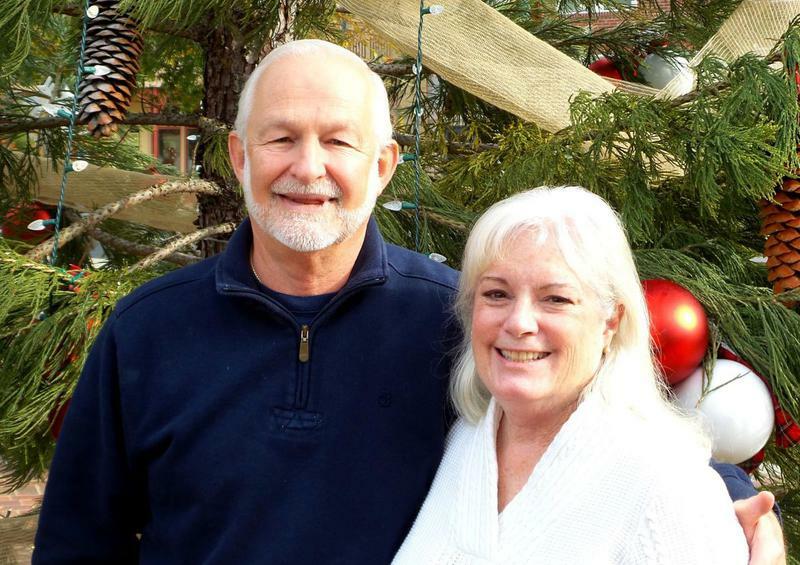 After seven years of as co-chairs for the Copperopolis Community Food Pantry, husband-and-wife team David and Lorraine Crawford announced they will step down this spring to spend more time with family and to travel. The Crawfords retired in 2007 from their high-stress jobs at Lawrence Livermore National Laboratory. He was a computer scientist and she was a weapons program secretary. They left those careers to settle in Copperopolis and make wine with grapes from their home vineyard. Within a year, the two were attending Copperopolis Canyon Baptist Church. There they met the Rev. Don Hopper, who told them about the efforts of the local food pantry to meet the needs of Copperopolis residents. After one meeting with the food pantry volunteers, the Crawfords knew what had called them to the foothills. “It is so rewarding just knowing you are helping somebody,” Lorraine Crawford said with tears in her eyes. When the couple first began volunteering, the only food source for the pantry was the Amador Tuolumne Community Action Agency. After the Crawfords took the reins, the pantry saw great growth. They became part of the Feeding America program through the Resource Connection. That has allowed access affordable produce and staples that gave the pantry the ability to serve more families with more products. The Crawfords were quick to point to all those in the community and beyond as the real reason for the success of the pantry. Through community dedication to the pantry from the Copperopolis Fire Protection District biannual fill-the-boot, Calaveras Community Foundation grants, Saddle Creek’s food drives and Young’s Payless IGA’s constant support both financially and with product, the pantry has expanded to new levels. Crawford said Young created a storage room for the pantry. The Calaveras Com-munity Foundation recently surprised the Crawfords with a grant to assist seniors. The two said that grant hit close to home. While the Crawfords might be stepping down, they are not leaving. They intend on continuing to volunteer with the food pantry and stay active in their church. Yet, with three grandchildren and two great-grandchildren, the two hope to spend more time with family and enjoy some road time with their two dogs Mollie and Jackson. The Copperopolis Community Food Pantry is currently serving over 60 families. It is at 3566 Spangler Lane, Copperopolis. Distributions days are from 1 to 4 p.m. on the third Thursday of each month. For more information, visit copperpantry.org. Article Taken From the Calaveras Enterprise. 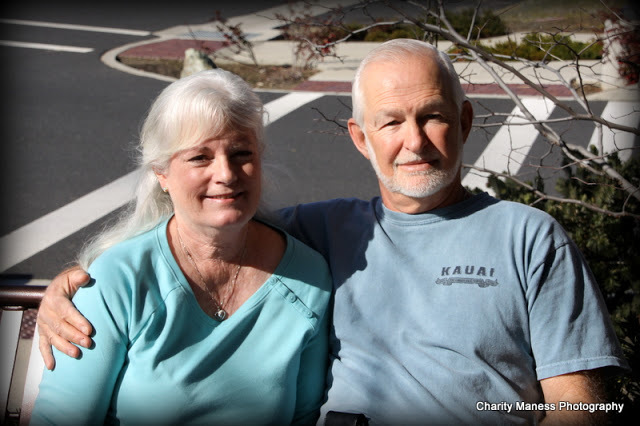 David and Lorraine Crawford look forward to family time, but are thankful for the experience of helping those in need at the Copperopolis Community Food Pantry.